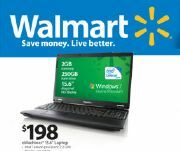 Walmart plans to sell a fully equipped laptop with a 15.6-inch screen for US$198 on Black Friday as part of a promotional offering, one of the few times the $200 price barrier has been cracked. The laptop will be on sale for a few hours in the retailer's stores on Nov. 26, which is one of the most active shopping days in the U.S.
Made by eMachines, the laptop includes features that could make it good for basic computing and day-to-day activities like Web surfing or word processing. It will come with an Intel Celeron processor running at 2.2GHz, a 250GB hard drive and 2GB of memory. Further details about the laptop configuration were not immediately available. Walmart did not immediately respond to requests for comment. Laptop prices have hovered over $399 most of the year, and the $198 price represents one of the few times a laptops has been priced under $200. Last year, Walmart offered an HP Compaq Presario for $298 during the July back-to-school shopping season, and that prompted a pricing war with rival Best Buy, which started offering a Toshiba Satellite laptop at the same price. Laptops offered at low prices typically lack some components. For example, the $298 Compaq Presario sold through Walmart last year lacked a webcam. Consumers in the past have also expressed concerns about the Celeron processor, which sits on the lower rung of Intel's processor family ladder. Laptops with Celeron chips are not designed for high-end gaming or multimedia activities. Faster processors -- like Intel's Core chips -- are more expensive. Walmart is also selling other consumer electronics such as Blu-ray players at low prices, according to the Walmart's Black Friday Web page. Laptops are among the top technology products on holiday shopping lists in the U.S., topped only by tablets, according to a study released by Retrevo on Wednesday.